Matrox C420 low-profile, quad-output PCI Express graphics cards are now available worldwide. Engineered for stability, reliability and multi-display capabilities, C420 has the features systems integrators require when designing small-form-factor (SFF) systems and digital signage player PCs for applications such as public information displays, video walls and multi-display operator workstations in process control, transportation and security control rooms. Matrox C-Series, which also includes the six-output C680 card, is currently being used by control room and digital signage solution providers worldwide including Scala. 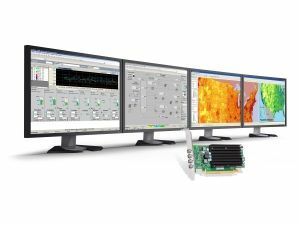 One display spread across four monitors using the C420 graphics card. C420 is fanless for reliability and silent operation. Its design and low power consumption make it fit for SFF, desktops and embedded systems. It drives up to four displays or projectors at resolutions up to 2560 x 1600 per output and two C420 cards together can drive eight displays from a single system. Secure Mini DisplayPort connectivity prevents loose cabling and 2GB of on-board memory ensures smooth video playback and graphics performance. C420 is compatible with Microsoft Windows 7, 8.1 and Linux operating systems and offers DirectX 11.2, OpenGL 4.4 compliance. The cards come bundled with Matrox PowerDesk for Windows desktop management software. Matrox PowerDesk lets users configure and manage multi-display setups giving professionals a set of tools to control a variety of display configurations including stretched or independent desktops, clone mode, pivot, bezel management, and edge overlap. Matrox desktop management features also let users determine where and how program windows are displayed on the desktop—a productivity tool designed for multi-display experiences.